To answer the question “how does online surveillance influence the Internet” we must first ask ourselves does surveillance influence behavior at all? Does watching someone affect the way they respond? Without being a scientist schooled in such matters I would have to say yes, but it depends on the circumstances. Someone who does not know they are being watched may not act any differently than they would under normal circumstances while someone aware of the surveillance may change their behavior. Think about it, a criminal aware of surveillance isn’t going to do criminal things while being watched. They are going to put on a show, act like nothing is going on and do all they can to hide criminal activities behind the smoke screen. Heisenberg’s Uncertainty Principle was first developed to define the limits of precision when measuring the position electrons in an atom. Now applied to most things in life it simply states that you can never be sure if what you observe is happening in its natural state because the act of observation alters and affects the object being observed. Even for those using the Internet for honest purposes may find themselves curbing their voices. Hot and controversial political topics may be avoided simply to prevent animosity from friends, family or employers. Here is a short list of behaviors and practices Internet users are adopting in response to the influence of government surveillance on the Internet. 1. Do not voice opinions online. People refrain from expressing opinion for a number of reasons including fear of the government, employers, family and friends. This trend is in opposition to the purpose of social media outlets which is to promote free expression, the sharing of ideas and discussion of current events. 2. Avoiding political and religious discussions. They say you should always avoid politics and religion in polite conversation and that is true of the Internet as well. As the world of social media and online expression grows so too does the need, or desire, to avoid hot political and religious topics for fear of attracting unwanted attention. 3. Agree with the status quo. People afraid of being singled out for a minority opinion may find that keeping silent is not enough. They may find themselves agreeing with the status quo or majority opinion in order to fit in and avoid scrutiny or isolation. How Does Government Surveillance Influence Behavior? In the case of Edward Snowden it caused him to reveal the largest case of government spying on the people in the history of recorded man. His 2013 bombshell blew the lid off the NSA’s domestic surveillance program and alerted the world to a breach of personal privacy not limited to the US alone. Not only was the NSA spying on its own people, it was spying on people from other countries. The biggest bombshell though was the idea and reality that any and all governments around the world could, would and are participating in many of the same surveillance activities. The Spiral of Silence is a theory of Mass Communication put forth by Elisabeth Noelle-Neumann in 1974. It proposes that people tend to remain silent when they feel their views are in the minority. The two main reasons are fear of isolation and fear of reprisal. At minimum an individual in opposition to the majority can expect to face some form of isolation as the population becomes aware of deviance from the norm. At worst individuals can expect some form of retribution for voicing their opinions which could mean loss of position/status, imprisonment or worse. The spiral, a downward spiral of fear and self isolation, comes into play when an opinion or viewpoint becomes favored by a majority of the people. The theory assumes of course that each individual is aware of the majority view and capable of understanding when someone is opposed to it. Once the majority begins voicing their opinions the minority begins to move away from the center of society to the fringes. The more extreme the view and its opposition, the faster the shift. In today’s world the media and the Internet play a big role in this model as they both have a tremendous amount of influence on public opinion and the speed at which it travels through the populace. Of course, you have to take into account the vocal minority and the power of the Internet. Not everyone is content to sit still and let things happen without trying to do something about it. The Internet may have a power to sway public opinion but it also has the power to empower the voices of minority groups. Individuals can hide behind screen names, use the TOR network and many other methods to anonymize themselves to the public, assuming of course that Big Brother isn’t watching. Surveillance of the Internet in most cases means collecting and sifting through mega, giga and terabytes of data, what we know today as Big Data. Big Data and its study, Data Mining, bring together aspects of computer science, machine learning, statistical analysis and database management to draw useful information out the sea of information we create on the Internet and which is collected each day. Each time we log on to the net, search, visit a website, post to social media, chat with a friend, purchase items or conduct business we leave digital evidence. That evidence can be linked together to paint a very accurate picture of us, down to the way we think and the views we hold. When governments collect our data, build vast databases and Data Mine it, they could use the information to prevent crime, but they could also use it to infringe on our rights. To isolate, repress or quiet opposition. Under Surveillance: Examining Facebook’s Spir’al of Silence Effects in the Wake of NSA Internet Monitoring, the study took a look at 255 people and their use of Facebook. After going through a series of questionnaires designed to assess political belief, personality traits and social media use, participants were then shown a series of fake news stories. They were then asked some questions about the stories, half the participants were reminded that the government may be watching their responses, the other half weren’t. Those who were reminded that their responses may be monitored by the government were found to significantly reduce their reactions. The study also found that those who felt they were in the majority were more likely to express their opinion than those who felt they were in the minority. Another study, by the Pew Research Centre in 2014, found that social media sites like Facebook and Twitter may actually encouraged self-censorship. Their study found that while the vast majority of Internet users were concerned about government surveillance and would talk about it in person, less than half were willing to do so on Facebook or the Internet. Other studies exist to back up these theories as well. They suggest that Internet users may avoid certain websites or refrain from using certain language merely to avoid seeming suspicious. Chilling Effects; Online Surveillance And Wikipedia Use, found “that the NSA/PRISM surveillance revelations not only caused a sudden chilling effect, but also caused a longer term, possibly even permanent, decrease in web traffic to the Wikipedia pages studied”. Consider this. Fear of surveillance could influence responses about fear of surveillance. How can we ever know for sure that the answers given represent the true feelings of the sample group? If a respondent is fearful of the government, or of being in a minority, they may tailor their responses to match what they think is the “right” thing to say. Amnesty International released a study in 2014 of 15,000 nationals from 13 countries. Of the many findings one is that most people do not want to be watched by the government while online, but fell less strongly about their government watching people from other countries. According to the results less than 25% of all respondents were in favor of government surveillance while more than36% were in favor of absolutely no surveillance of any kind. The interesting point is that 60% of respondents say that government surveillance of the Internet would not stifle their criticism. As the perpetrator of surveillance learns more and more about us, they are able to categorize us, predict our behavior and single us out for the purposes of discrimination, coercion and selective enforcement. A false-positive or subjective reading of data could result in one of us being selected for “special” attention for no fault of our own, with no means of correcting the issue. Social scientists theorize that surveillance comes down to power. It enhances the sense of power felt by the watcher while increasing the sense of powerlessness of the watched. With power comes corruption and with absolute power comes absolute corruption. It is true that Internet surveillance could prevent many crimes and acts of terror but it is also true and just as likely that government surveillance will result in some misuse. 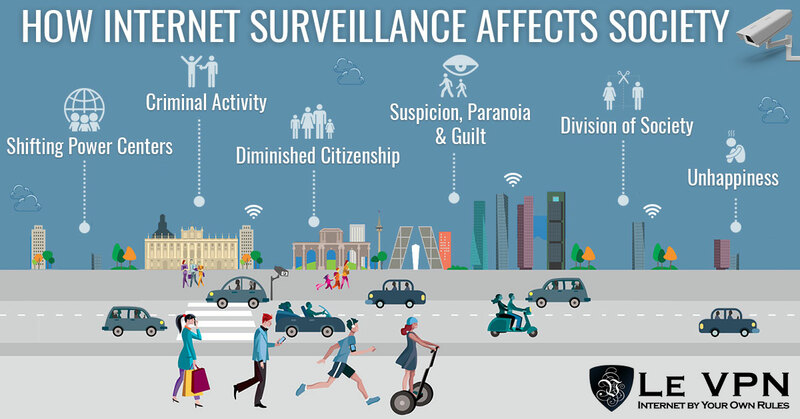 Surveillance also has the effect of turning citizens into criminals by bending laws to create criminal behavior or fomenting hostility and criminal behaviors among the population. A few of the possible criminal uses of collected data include insider trading, theft of business ideas/secrets, blackmail and sexual harassment. Government surveillance could curb use of civil liberties, the expression of new ideas and evolution of society. Neil M. Richards argues that intellectual privacy is key to a free society stating that surveillance protects the status quo. Basically, if Big Brother is watching what Big Brother says is what shapes the social reality. In this paradigm democracy and democratic process is stifled. In a society dominated by government surveillance people begin to feel suspicious of each other and everyone they meet. Are they watching, are they keeping track of me? This leads to paranoia and feeling like no one can be trusted as hostility grows between the watched and the watchers. Researchers have even found that living under constant scrutiny can lead to feelings of guilt and culpability. Surveillance leads to a polarization of society between the watchers and the watched. Rights, responsibilities and privileges begin to become distributed based on often subjective criteria imposed by the watchers. As the watcher casts emerges it may seek to entrench its power base with increased surveillance, punishment and control of “inferior” or “suspicious” portions of society. The bottom line is that surveillance creates unhappiness throughout society, for the watchers as well as the watched. When an individual can not go anywhere without having their movements videoed, their emails read, their internet traffic monitored and phone conversations recorded they experience anger, resentment, helplessness and despair. The watchers, who may have an easier life, are still faced with isolation, loneliness and hatred. Fighting back against surveillance is the responsibility of all global citizens, if we want to see society progress and move forward. The irony is in the solution, VPN, a technological break-through created by the very government at the heart of the Internet surveillance issue. The use of VPN will keep an individual safe from watching eyes, the use of VPN by the masses will make it impossible for the government or anyone else from creating a surveillance society. VPN stands for Virtual Private Network. It was developed alongside the Internet for use by government agencies, the military and big business to create safe and secure connections. While private networks were safe from outside influences the public Internet, as we’ve come to realize, is a Wild West of potential threats. The VPN uses “tunneling” protocols to create the “virtual” private network. The virtual private network uses a system of dedicated servers to bypass ISP gateways, mask identities and hide connections from prying eyes. 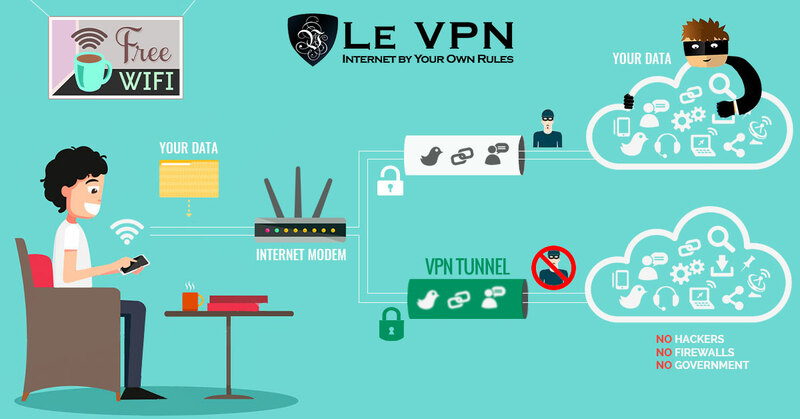 Top-level VPNs like Le VPN include encryption as well to ensure complete privacy. The way it works is like this. VPN software on your device wraps your connection in a digital disguise so that anyone observing it will not know who it is. Once disguised the connection sneaks out a secret back door so that anyone watching your device won’t see it leave. Before going on to the destination your connection stops over at a safe house, the VPN server, which provides a new IP to help it on its way. When your connection does pop out in the Internet-at-large, it is random, anonymous, unidentifiable, undecipherable and unsurveillable. Your IP Address is masked by the VPN servers which make your connection anonymous. This means that while you may be observed visiting certain websites whomever or whatever is observing you won’t know who you are simply based on your address. It also means they won’t be able to track you back to your location, or aggregate whatever data they collect into a dossier about you. It is impossible to guarantee a 100% invisible connection but the VPN gives the closest thing available today. The connections bypass local ISP access points in favor of the VPN server network. This prevents the ISPs from tracking and monitoring you and anyone who may be watching those gateways from seeing you. If by chance they did become aware of the connection it would seemingly come from nowhere and go to nowhere. GPS tracking, cell tower triangulation and other forms of digitized geo-location can be avoided and prevented. 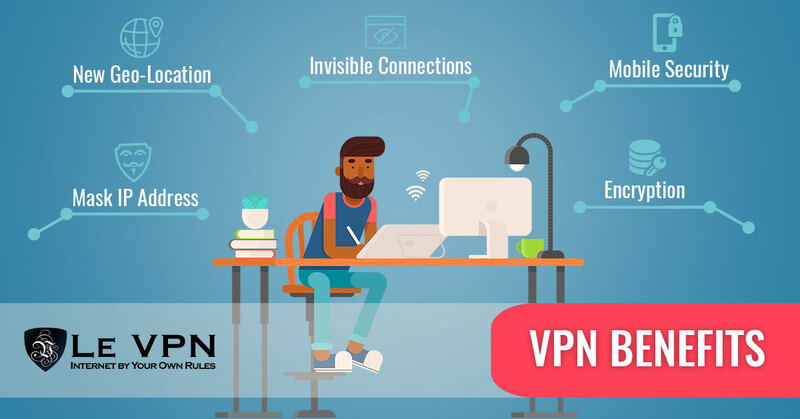 VPN connections bypass the ISP in favor of a VPN server in a country of your choice, which prevents anyone watching or controlling the Internet locally from seeing you, and anyone who may see you will think you are from the country in which the VPN server is located. VPN can be used with mobile devices. Top rated VPNs like Le VPN offer user-friendly VPN apps for Android and iOS enabled devices including phones and tablets. Use the VPN to connect with the Internet using your phone, mobile or laptop to avoid detection. Truly sensitive data, or connections made in restrictive locations, enjoy the benefit of encryption. This means that on the chance that some government or agency is able to find and watch your connection, and then able to break into it, they won’t be able to do anything with what they find. Bottom line, VPN makes seeing your connections, finding you specifically, cracking your traffic and decoding your data so incredibly difficult it will never happen. The extent to which government surveillance affects Internet behavior is questionable. The fact that it does influence behavior is, I think, without question. The right or wrong of it and its use in society will be debated long into future, until then you can do something about it. Get Le VPN and use the same technology to protect yourself from government surveillance that the government uses to protect itself from surveillance.